Random Thoughts of Gil Camporazo: Fire is Friendly. Fire is Deadly. Fire is Friendly. Fire is Deadly. Fire could be very useful when it is used properly. But fire is very deadly when it is left unattended to. It could claim several lives and consume properties to ashes. Here in the country, PH, March is observed as the month of fire prevention. While in the United States, it is in the month of October. Ironically, however, two fires occurred in Cebu City recently, bringing to 10 the number of fires happened in March, which is being observed as Fire Prevention Month. It was caused by a candle which got dropped in a prayer session at a Cebu resident's room. On the other hand, it is worthy to note that the National Fire Protection Association disclosed that there are between 350,000 and 400,000 houses fires in the United States every year. This is considered as the biggest disaster threat to families in that country, above floods and hurricanes. Wanting to prevent more fire incidences and so that the people may be educated and kept well aware, fire prevention month is observed. In our country, this is the 47th year of fire prevention month observance. The Bureau of Fire Protection (BFP) which is established through the enactment of Republic Act 6975, otherwise known as the Department of Interior and Local Government Act of 1990, which took effect on January 1, 1991, is responsible for ensuring public safety through prevention and/or suppression of all destructive fires. And it is also responsible for the enforcement of the Fire Code of the Philippines (PD 1185) and other related laws, conduct investigations involving fire incidents and causes thereof including the filing of appropriate complaints/cases. There is a saying that says: "Education begins at home." Thus, "safety begins at home too." 1. Before leaving the house, always unplug electrical appliances. 2. Switch off the main source of power. 3. Do not leave lighted candles, lamps or cigarettes. 5. Secure flammable/combustible substances in a safe area. 6. If possible, ask your neighbor or nearby friend/relative to check your house from time to time. 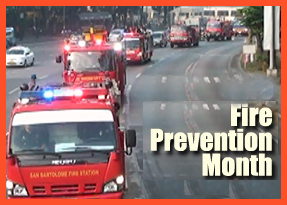 This March 1 marks the beginning of the observance of the Fire Prevention Month nationwide. As administered by the Bureau of Fire Protection (BFP), the local government units, firefighting agencies, schools, and other institutions have signified their participation. This month-long observance is usually ushered by a parade of firetrucks with a firefighters brigade volunteers, a short opening program, symposium, fire drills, among others. Sabi nga nila. mas mabuti pang manakawan bsta hindi lang masunugan. Mahirap masyado kasi its like you will start back from zero again. This is a good post, it gives awareness and advices. Tnx Sir Gil! great timely reminder post! and i agree that safety begins at home!! !thanks Gil for sharing. Fire is such a terrible disaster that when it hits you..it will take everything you have. Everybody should be really careful when using fire. Hay naku, ang hirap pag nasunugan, ubos lahat! i salute the BFD because they take an effort to educate the people.